The following is KFIO's story of how it transitioned from an educational radio station to a commercial radio station as well as a description of the station itself. Citing various technical deficiencies, O. R. Redfern, FRC supervisor in Seattle, informed KFIO on January 1927 that it needed to rebuild the station or its license would be cancelled. In response, in April 1927 the Spokane School District loaned the station $1,000 to rebuild the station and to place it on a commercial basis. Up until that time, the station had relied on donors and student fund raisers to obtain the needed equipment. In response, Arthur Smith noted that he was in the process of obtaining new equipment, and that the work to re-build the station would be done over the summer break. However, KFIO continued to have problems staying on the air. In February 1928, the FRC declined to renew the station's license until the situation improved. FRC Commissioner Harold A. LaFount went so far to note that as an alternative to getting the station back on the air, two local stations had offered free of charge to broadcast programs produced by students. Work to get the station back on the air continued until 11 February 1929 when the station returned to broadcast as a commercial station five days per week, seven hours per day. 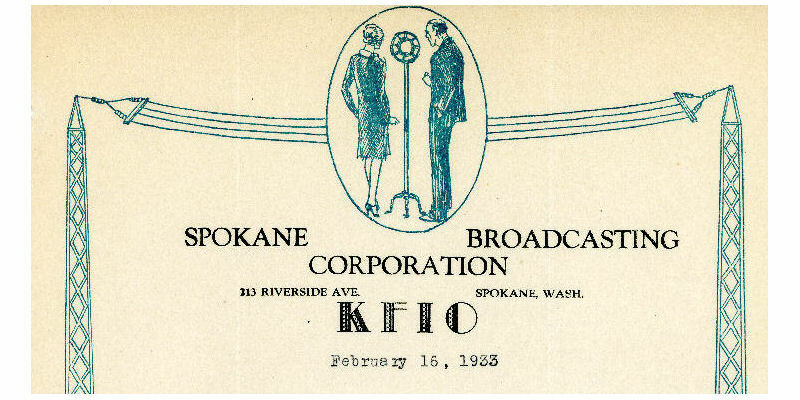 However, the school district received pressure from the other Spokane radio stations to force KFIO to cease broadcasting as a commercial station and on 15 June 1929 the school district formally told Smith to cease commercial broadcasting. On 1 August 1929 after some controversy, Mr. Smith and his two partners W. S. Gilbert, and Morris H. Willis bought the station from the Spokane School District. 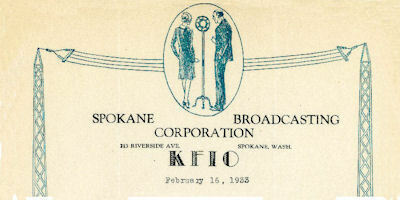 KFIO continued to lease the North Central High School transmitter facility until 19 July 1930 when they moved the transmitter and studios to the fifth floor Pedicord Hotel at 213 West Riverside in Spokane. The relationship between KFIO and North Central High School was officially severed. The FRC records state that KFIO's mailing address was 528 West First Avenue from 1 August 1929 to 19 July 1930. Although the records do not explicitly state where the offices and studios were located, it would not be unreasonable to assume they were located at the above address. 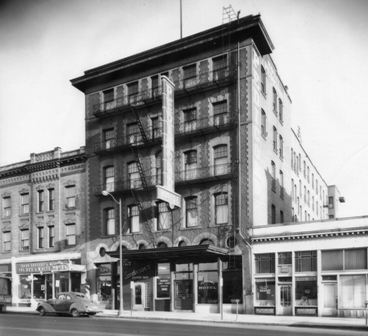 The Pedicord Hotel was the home to KFIO from August 1930 to May 1935. Newspaper articles of July and August 1930 state that the station's offies and two studios were located on the hotel's fifth floor. D. Windsor Hunt, a student of Arthur L. Smith and announcer at KFIO, noted that KFIO had a real studio at the Pedicord, one where you could see the operator through a glass window. It had several chairs in the back for an audience in a room that was about 20 feet by 30 feet. Mr. Hunt also indicated that the Pedicord was a speak-easy during the Prohibition. The Pedicord Hotel no longer stands as it was razed many years ago. Hill, Guy, Captain, Acting Chief Engineer, Federal Radio Commission, Seattle, Washington. Memorandum for the Record. 21 August 1929. Broadcast Licence Records Archives. National Archives. College Park, Maryland. Hunt, D. Windsor in "Early Days of Spokane Radio." About 1980. KFIO Application for Radio Broadcasting Station License. Federal Radio Commission, Washington, DC. 12 Jun 1930. Broadcast Licence Records Archives. National Archives. College Park, Maryland. KFIO Consent to Voluntary Assignment of Radio Station License. Federal Radio Commission, Washington, DC. 12 June 1930. Broadcast Licence Records Archives. National Archives. College Park, Maryland. "KFIO Has Housewarming" Spokesman-Review. Spokane, Washington. 27 August 1930. KFIO License to Cover Construction Permit. Federal Radio Commission, Washington, DC. 12 October 1929. Broadcast Licence Records Archives. National Archives. College Park, Maryland. "KFIO Station to be Improved." Spokesman-Review. Spokane, Washington. 27 April 1927. "KFIO Will Have New Quarters" Spokane Chronicle. Spokane, Washington. 4 August 1930. "KFIO to Move New Equipment" Spokane Chronicle. Spokane, Washington. 19 July 1930. LaFount, Harold A. Federal Radio Commissioner. Letter to KFIO dated 11 February 1928. Broadcast Licence Records Archives. National Archives. College Park, Maryland. Smith, Arthur L. Letter, Spokane, Washington to Edwin W. Lovejoy, Federal Radio Commission Supervisor, Seattle, Washington. 14 June 1929. Broadcast Licence Records Archives. National Archives. College Park, Maryland. Wasmer, Louis - KHQ; Symons, T. W. - KFPY; Studebaker, H. E. - KGA. Telegram to Federal Radio Commission. 21 June 1929. Broadcast Licence Records Archives. National Archives. College Park, Maryland.